Miles of winding, tree lined jogging trails frame beautiful, sparkling, fish filled lakes positioned throughout this magnificent 7400 acre master planned community. A cream-colored sand beach, surrounded by a half acre, four foot deep swimming lagoon, filled with crystal clear blue water, brings a tropical feel to those long hot summer days. Located west of Houston in Katy, one of the nation's most dynamic centers for residential growth. The Energy corridor along I-10 is world renowned as a hub of major corporations in the energy industry, engineering and related fields. The area is also a thriving retail center, boasting large regional malls, restaurants and movie theaters. The largest development of its kind in the western quadrant of the city. Ultimately, Cinco Ranch will offer a comfortable blend of commercial, residential, and recreational opportunities. Developed as a collection of neighborhoods the residential design creates a pleasant atmosphere to foster friendly relations between neighbors and a strong community spirit. 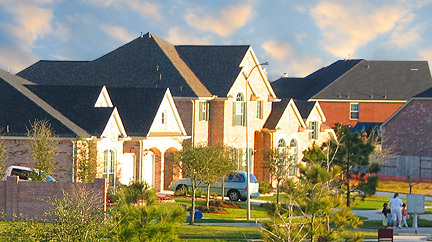 Cinco ranch is also dedicated to creating an environment for commercial development. Cinco Ranch currently is home to approximately 6800 families and is one of the fastest growing communities in the Houston area. Many of Houston's award-winning homebuilders offer homes from the $150,000's to $900,000. Access is via I-10 and the Grand Parkway, Fry Road mason Road or FM 1093. 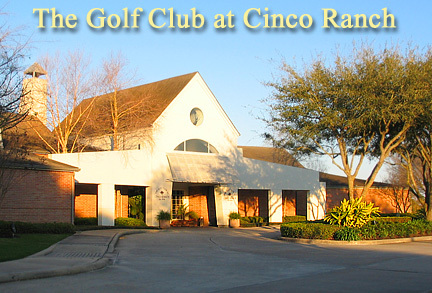 The Golf Club at Cinco Ranch is one of Houston's finest upscale daily fee golf courses. This premier 18-hole championship course features a Carlton Gipson designed layout which is located in the master planned community of Cinco Ranch. As at the finest private clubs, a warm atmosphere and courteous professional staff will make each and every day a quality golf experience. The course combines water, bunkers, and a rolling terrain to give the Golf Club at Cinco Ranch its uniqueness. Open for play on a daily fee basis to both Cinco Ranch residents and non-residents, the par 72 course is very versatile with its four sets of tee boxes. One can tackle the course from the "Cinco" tees which play to 7,044 yards, the "Tournament" tees at 6,503, the "Regular" tees at 5,940, or the "Forward" tees which play to a distance of 5,263 yards. There are numerous sand bunkers and water hazards that come into play surrounding the well manicured fairways and greens. The Golf Club at Cinco Ranch is a facility that offers a wide range of challenges and enjoyment for golfers of all ability levels. The spacious ranch style clubhouse is home to The Lone Star Grill and Bar, and banquet facilities which have a wonderful view of the golf course. A wide variety of food and beverage services id offered. The banquet facility is available for private parties, weddings, corporate meetings, and golf related events. With more than ten active residential neighborhoods - and more opening all the time - Cinco Ranch has something for everyone when it comes to finding the perfect new home. 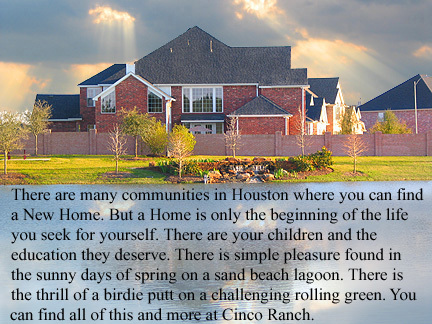 Cinco Ranch offers new homes priced from the $110,000s to over $1 million, by some of Houston's leading homebuilders. The neighborhoods of Cinco Ranch offer new homes in a wide range of prices, from the $110,000s to over $1 million. From the most affordable neighborhoods to the most prestigious custom home sections, the Cinco Ranch community creation philosophy ensures that every neighborhood is near a full complement of recreational amenities, schools and shopping. All Cinco Ranch neighborhoods feature distinctive entry monuments, cul-de-sac streets, access to greenbelt trails, and tree planting or tree preservation programs. The Cinco Ranch Beach Club, a private facility reserved for the use of residents, features a four foot deep, half acre swimming lagoon, also 6,500 square feet of clubhouse decking adjacent to the beach, sand pit volleyball court, picnic tables and lifeguard stations. Cinco Ranch Water Park, A sixth major recreation center opened in may 2002 west of the Grand Parkway. Featured is a large free-form pool with waterfall, waterpark-style slides, a grotto, spray-ground, diving well, basketball court, picnic areas, huge covered pavilion with built-in bar-b-que grill, and tennis courts. Recreation Centers/Pools, in addition to the Beach Club and the Water Park are in North Lake Village, Greenway Village, South ranch, Park Hollow, and highland Park. Two Recreation Lakes, South lake and Park Lake, provide water activities in addition to the Beach Club. Picnic areas and park benches surround the entire lake system. Consisting of 14 acres, South Lake hosts fishing, sailing and paddle boating. Park Lake is a four-acre lake with a dramatic night-illuminated fountain. The Green-Belt System that meanders throughout Cinco ranch offers residents a paved scenic path for walking or biking. Benches are positioned along the greenbelt system to allow residents to stop, rest and enjoy the great outdoors. Pocket Parks are located along the greenbelt system that runs through various neighborhoods. Cinco Ranch's Bayou Nature Trail is a two mile hike & bike trail with wooden bridges, look-out points and resting benches. 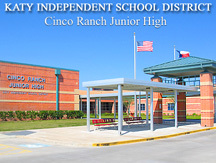 Educational info., school listings, phone numbers, addresses and much more. 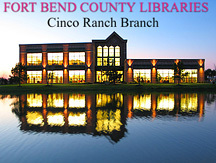 Cinco Ranch Branch, Located in Katy, Texas, across from the Cinco Ranch High School, just off Cinco Ranch Boulevard.